There was certainly traffic, but.. I was all psyched about getting up in the air and videotaping the expected back ups along I-75 and US 2 with the closure of the Mighty Mac today. I Had the video camera ready, had the glass on the cameras, and then nothing. Storms rolled through the region, and the flight plans changed from getting to the trouble spots on time, to about 2 hours late. We hit the bridge about 40 minutes after it had already opened. No cool video of 50 miles of traffic back-ups, and no pictures of the throngs of people breaking in a new set of sneakers. Chalk it up to how things can go sometimes. 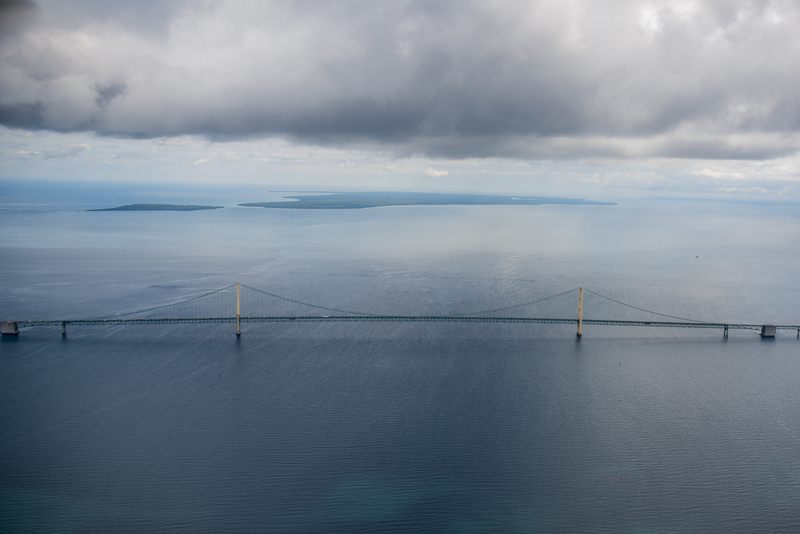 So until the next over-hyped thing we promote here, enjoy an aerial picture of the bridge as it rests underneath a rain cloud. I was on the ground at 5:30 a.m. and the buses hadn't started running yet. This is after spending the night in a cow Pasture using a picture window outhouse, waking up to a JUGE thunderstorm being sheltered by only a tent. Only then remembering why not to go camping--not to mention the camp fire lingering in one's nose for days after. Every single state cop in the state was there--one on each bus. Trying to get nominating signatures in a bus line with thousands of folks, which was moving pretty fast, became quite a task. It was a very orderly crowd and a JUGE mistake for the Bridge Authority to have closed traffic on the bridge for six hours. In fact, none of the local streets were really closed to traffic and it seemed to me more damaging for the Authority to have announced these "safety" measures months in advance causing hysteria only in the small minds of those Bridge Authority folks. It certainly didn't stop the determined bridge walkers. With still, in my estimation about 10K still waiting to board buses, at about 9:30 a.m. the very friendly state cops went up and down the lines saying sorry, you won't be able to walk the bridge as bus boarding will stop exactly at 10:00a.m. Those same buses then became the buses to take those who started on the North, back to St. Ignace. Michigan must have open borders as I met folks from Tenn, KY, OH, IN and Canada and a family from China. The Canadians were from Ontario--south of Detroit. The very first folks I talked to were from TC--now how disappointing is that. I turned out weather-wise to be a great day--not too hot or cold--or windy. Folks were in a great mood. Would I do this event again?? . . . I appreciate that report. There is a lot of information that fills in some blanks. thank you.